Running single cars with shorter headways will slow service down. Only so many cars can stop at a station at once. The station stop time is an issue. Every train/car needs to pull in, open the doors, pick up/drop off passengers, close the doors, and go. If the trains/cars are following each other, they would need to wait for the one in front to finish before the next one can pull in and do the same. With everyone trying to cram into a single car, station dwell times will increase, backing up the system. This reminds me of the big dropped trips issue the T admitted to several years ago now. They were not filling in for people that called in sick on overtime. This created a lot of single car trips when trailer operators were required to take trains on their own. If this happens again and there is no trailer operator, then the service will really suffer! Moonlighting, sleeping texting. I'm thinking its time to jump all the way to a ZPTO system--at least in the tunnels--just like Google's self-driving cars. Once you've got Laser/Ultrasound/Radar rangefinders on front, rear, and sides, a computer is going to be way better at situational awareness than a distractable, vision-limited human. And the highway technologies are already here for high-speed, low-separation, collision free. True, there's no GPS in the tunnels, but then again Google using the GPS for route-making, not close navigating, and on the Green Line the rails do the route making. At least in the tunnels, where there's no rain to interfere with the laser rangefinder, the technology to replace the operator on the Green Line is already here. The operator can be used for fare-enforcement if you'd like and opening closing doors, perhaps. Of course Prague is among the POP systems that works just fine with nobody staffing the trailer. Time to take human error out of the equation at the front of the train too. diburning wrote: Running single cars with shorter headways will slow service down. Only so many cars can stop at a station at once. The station stop time is an issue. Every train/car needs to pull in, open the doors, pick up/drop off passengers, close the doors, and go. If the trains/cars are following each other, they would need to wait for the one in front to finish before the next one can pull in and do the same. With everyone trying to cram into a single car, station dwell times will increase, backing up the system. Precisely. And that's why - if it were operationally feasible - the T should run as many three-car trains as possible. Two three-car trains will carry the same number of passengers as three two-car trains, but their throughput will be faster. Average wait time for a train will increase, but not by as much as you'd initially think. Plus, with OPTO and POP, even fewer operators would be needed. sery2831 wrote: As for POP, there has to be a change on how the fares are collected at the subway stations. For one, pass back privileges on the Charlie Card and Charlie Tickets would have to be eliminated. Every person would need to have a physical proof of payment(too much room for stories like oh my friend let me in on his Charlie Card and went to Braintree while I am going to Harvard Ave... for example). They would have to sign all the stations to keep your ticket and not deposit it in the handy recycling bin they provide just inside the fare gates at most stations. There would have to be a true penalty for fare evasion and not small fines which the State seems to be resistant on passing. And the biggest issue would be installing Fare Vending Machines at all the surface stops. It would be unrealistic to expect everyone paying to use ONE fare box on a train at rush hour! What pass back privileges? There are no pass back privileges on either fare media. You use a daily/weekly/monthly pass to enter a station, you can't use that pass at that station again for half an hour. You use cash value on the card or ticket and open the gate twice... you get charged twice. As for putting in Fare Vending Machines... yes. Absolutely. There should be at least one FVM at every single surface stop, and at least one FVM at every single commuter rail stop. We ought to be putting these things up everywhere we can find room for them. Commuting Boston Student wrote: What pass back privileges? There are no pass back privileges on either fare media. You use a daily/weekly/monthly pass to enter a station, you can't use that pass at that station again for half an hour. You use cash value on the card or ticket and open the gate twice... you get charged twice. There are pass back privileges on both fare media. You may pass your Ticket back up to five times providing enough fares are loaded onto the ticket. And with the Card, exactly what you said will happen and allow for two people to pass through the gate. Commuting Boston Student wrote: As for putting in Fare Vending Machines... yes. Absolutely. There should be at least one FVM at every single surface stop, and at least one FVM at every single commuter rail stop. We ought to be putting these things up everywhere we can find room for them. FVMs at every surface stop would cost too much to maintain. With the farebox being able to dispense change Tickets and reload Cards, there is simply no need. As far the CR, the Charlie Card is not going to happen. So Smart Phone technology will be future here. Remember these machines cost money to operate and maintain, more is not the answer with them! This is getting off topic. Please keep any Charlie discussion to the Charlie thread... That includes ANY replies to this post! ZPTO: A completely new and unproven technology running equipment not designed for it at high speeds in close proximity. The computer tells the second car of this "train" to slow down because the first one did, but through a computer glitch or mechanical failure this action isn't carried out. Now instead of a physically coupled train simply taking longer to stop, you have in impact, damage to equipment, and possible injuries. Injuries which can't be discovered or reported until help arrives because there's no one around with adequate means of communication to report them. If my involvement at Museums and my acute scrutiny of transit operations has taught me anything, it's that simplicity=reliability. On the green line, an operator recently had an accident allegedly due to fatigue which caused several minor injuries. In Washington D.C., a older and simpler computerized system failed killing people. New cars and buses often fail while there's nothing wrong with them because a failed sensor thinks there's something wrong. I certainly wouldn't trust an even more unproven and complex technology to operate a large vehicle, I'd rather risk injury to avoid death. sery2831 wrote: There are pass back privileges on both fare media. You may pass your Ticket back up to five times providing enough fares are loaded onto the ticket. And with the Card, exactly what you said will happen and allow for two people to pass through the gate. That's the first I've heard of the five-swipe limitation for stored value CharlieTickets. What happens if you try to swipe a sixth time, and have enough money for six fares? Do CharlieCards have a similar limitation? subject to a 18 minute lockout at the same station or on the same bus route and not allowing pass backs? car I was riding and he thanked me and called it in...Was that double fare collected on that line changed? Ignore the claims. Same guy said the OPTO was unproven, dangerous and was going to wreck havoc on the MBTA. Naturally, he hasnt retracted the claims, even after the move to OPTO resulted in zero problems. So now the argument is exactly the same but with ZPTO? To say OPTO hasn't resulted in any problems is simply not true. While its correct to say that nobody has been dragged to an untimely death (yet), there has undoubtedly been a negative affect on performance caused by OPTO on the Red & Orange lines. Both lines, since implementation, have suffered from increased dwell times. This is particularly true at stations with left side platforms (almost the entire Orange Line) and stations with double platforms. 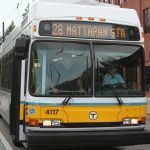 The increased dwell times, and their affect on proper headways, is a problem the T openly admitted to during their Red Line OPTO presentations in 2011. During the same presentations disability advocates spoke of the problems the handicapped, most especially the blind, have had in regards to proper boarding post-OPTO. One representative spoke of the number of white-tipped canes (used by the blind) which had accumulated at the T's lost and found as a result of train doors in the rear-most cars closing on said sticks and carrying them away. She listed Downtown Crossing and State as the most common stops for doorway infractions regarding the blind. Interestingly enough, as Crail87 pointed out in previous posts, the Motorman cannot see the last two cars by line of sight alone at those two stations. Its also an incredibly valid point, in my opinion, to say that removing uniformed representatives of the Authority from each train to give them a useless flashlight jiggling position on station platforms is a big mistake. When an emergency occurs platforms are the easy thing to manage. You shuffle people up the stairs, out of the station, and onto the sidewalks - its simple. Managing people during an emergency who are trapped in a steel box underground is a different story. I strongly suggest that anyone who believes additional employees on board are unnecessary read the interviews with the 6 Green Line Motormen involved in the 2008 and 2009 crashes. Despite being injured themselves they each took headcounts of their riders, identified those who needed the most help, radio'd for help, and assisted emergency responders in accessing both riders and equipment. Also, symbolically, the Train Attendant on the last ever Two Person Train Operation trip out of Alewife on March 24th was the first responder to a medical emergency (heart attack) at Porter. My point being - OPTO hasn't been perfect and has resulted in problems. To add to the comments above, having platform attendants assisting the motorman discredits any claim that OPTO works, because it isn't a one person operation if several people have to help. Humans can fly (if they're contained within a large vehicle propelled to speeds greater than 5 times what's humanly possible), and three month old babies can walk around the house (with their parents holding up their arms replacing the need for balance), and of course the lines run flawlessly, or almost as flawlessly, or not flawlessly at all, even with the help of numerous employees (second, third, and even fourth operators) standing by at platforms to assist the one operator in his/her duties less effectively than they did on board the train where they're classification actually employs them. I've not retracted my statements because they continue to hold merit. While others have changed their arguments and have fumbled to come up with new ones when theirs were dis-proven or compromised, my arguments have been consistent and persistent throughout. A reliable and efficient operation requires people, and a lot of them. Take them away, and it will come at a great cost.